There are plenty of different lewd strategy, RPG and visual novel games on the market right now. 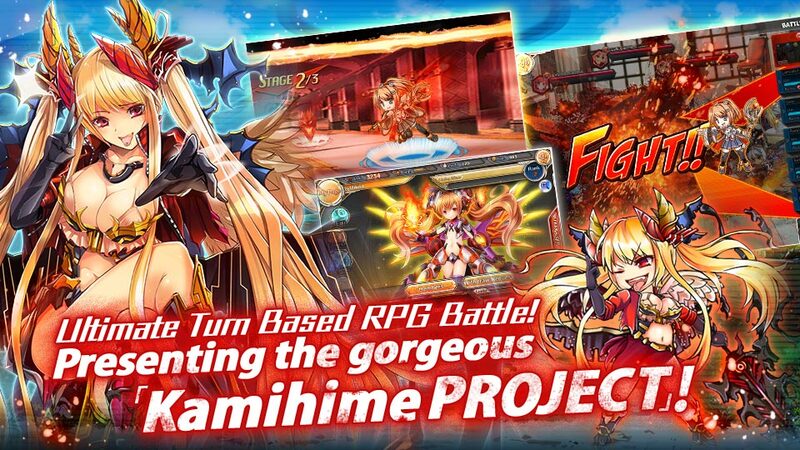 Even so, one particular game that stands out in the crowd is the F2P turn-based RPG/visual novel, Kamihime Project. There are plenty of things to explore and experience in Kamihime Project, offering up hours of game play. Right off the bat, it’s the kind of game that’s very easy to learn, but a bit harder to master. Even though you’re good to go in just a couple of minutes, you will soon realize that there are a lot of challenges to be had. Since there are also visual novel elements to Kamihime Project, you get to experience an interactive story telling with an adventure element. As soon as you boot up the game you almost immediately get thrown directly into the world and story of Kamihime Project (We won’t spoil anything, but the game starts off with a rather lewd scene). Kamihime Project takes place in a fantasy-like world where dark forces are on the move. So it’s up to you (the player) and your allies to take on evil and save the world from oblivion. You can use special super attacks once your characters have charged up enough power to do so (these attacks made us think about a combo of Marvel Vs Capcom and Chrono Trigger). There are plenty of different collectible Kamihime (the fighter babes of the game) that you could use on the battlefield, and each of them has their own unique personality, skills, weaknesses and strengths. Kamihime Project has a colorful and interesting line-up of characters, and most of them are really well-written as well (the dialogs are pretty darn entertaining). Diabolos is without a doubt a favorite character in Kamihime Project. Not only is she cute and cool as hell, Diabolos also happens to be the voice of one of the best Japanese voice actors we’ve heard in an RPG/visual novel game. The combat is turn-based and very straight forward, just like old-school classic turn-based RPGs like Chrono Trigger, Final Fantasy or Shining Force. You can use normal attack, magic attack or special attack. You have to think before you act though, because some stages consist of more than one stage. You have to survive through all the stages based on what you have at your disposal. Let’s face it, there’s nothing worse than pixilated lewd content. Thankfully the lewd content in Kamihime Project is fully uncensored. The lewd content, the story, characters and voice actors, are the best qualities of this game. All in all, this turn-based RPG/visual novel is definitely worth checking out. Thank you for playing Kamihime Project. New Gacha Campaigns are now available! The [Advent Battle vs. Nandi] has begun!